TGCET 2019 TSRS 5th class admission test 2019 (TRIES 5th Class Entrance Test) /TGCET 2019, TS Gurukul CET,TSRIES hall tickets 2019, #TSRS CET 2019, #TSREIS #5th Class Admission Test 2019. TS Residential Schools 5th Class Entrance Test 2019,TREIS 5th Class Entrance Test 2019, TGCET 2019, TS Gurukul CET 2019, Telangana Gurukul CET 2019, 5th Class Entrance Test 2019, Telangana Gurukulam Common Entrance Test 2019, TS Gurukulams 5th Class Entrance Test 2019 , TS Gurukulam 5th Class Entrance Test 2019 Telangana State Residential Educational Institutions Society has issued TSRS 5th Class Admission Test 2019 Notification on January 21st, 2019. 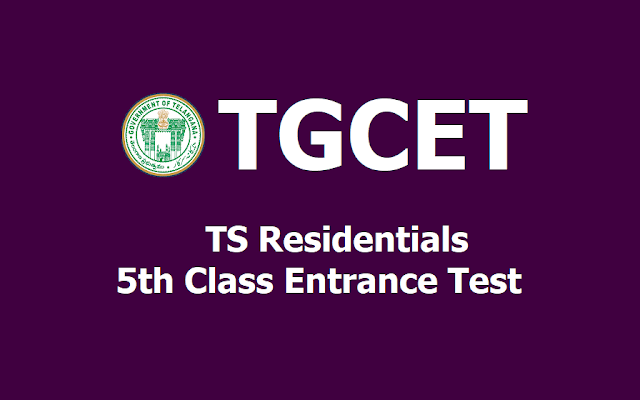 Tealngan State Residential School(TSRS) Entrance Test 2019 for admission into 5th class in Tealngana Residential Schools in the T State for the academic year 2019-2019. GURUKUL(Residential School) Education which helps a person's behavioral change to expected level. He will be moulded as a statue by education from the state of rock. But all of them do not have such facilities to study in the well sophisticated schools. This is due to illiteracy of parents, poor back ground etc. For such people Telangana Gurukul(Residential) educational society planned to take admissions into 5th class English medium (state syllabus) for the academic year 2019-17 by conducting an this entrance test 35 General, 12 minority Gurukul schools are running under this society. (including regional centre for excellence Telangana gurukul Boys school, Nalgonda DT). TGCET ~ TS Gurukulam 5th Common Entrance Test(Residential School's Common Entrance Test) 2019 notification has been announced on 15th February 2019 by TSWREIS Officials for admission in SC, ST, BC Gurukulams. Online application forms submission from 19.02.2019- 16.03.2019 duration for application. The Telangana Government will fill the 240 seats in newly sanctioned in 119 BC Gurukulams. Candidates should have age between 9 to 11 years for General Students and 9 to 13 years for SC, ST Students.